There are many advantages to living in a city. However, one big disadvantage is noise. Earplugs would do the trick, right? But honestly they aren’t the most comfortable thing to wear at night. Closing the windows and drawing your curtains are your other options too, but what if they still can’t keep noise out? What if you want to enjoy the cool outdoor air during the fall and winter months? So we went looking for answers and found some exciting sound masking gadgets for small apartments. The first sound masking gadget is called the Nightingale by Cambridge Sound Management. What makes this product different from other sound machines is that it takes into consideration the acoustics of your room. The product works in pairs and placed on opposite sides of a room. A “Sound Blanket” of ambient noise is emitted from the two speakers at the out edges of the product, essentially creating a surround sound environment. The product is out now currently and is meant for US electrical sockets at the moment. We also checked their FAQs and they mentioned that the Nightingale can be attached on the wall via a locking pate (nice option for renters). We will definitely update you all on this product and its availability in Hong Kong. 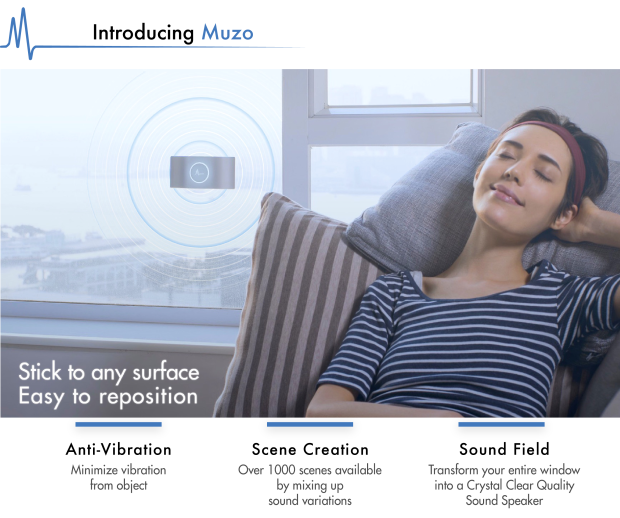 Another sound masking gadget we are pretty excited about is Muzo and it takes noise cancelling to another level. This product completely reminds me of the Cone of Silence from the movie “Get Smart”. This gadget provides anti vibration technology for smooth surfaces and minimizes unwanted nearby noise from penetrating the area/space you are in. This product seems to be portable and more adaptable for multiple environments. It more than exceeded its crowd funding goal for Kickstarter and Indiegogo so this should tell you the need for such a product for consumers. So how do sound masking gadgets maximize space? Noise has a lot to do with a cramped feeling in an environment. In Hong Kong, its common to hear your neighbor’s game of Mah jong, or the debilitating renovation sounds from other neighboring apartments just to name a few. If there are products that can push away the noise, then it would make living in our small apartments a much more spacious and serene atmosphere. We hope to provide an update about these sound masking gadgets for small apartments in the near future!